Thank you for considering having a CYC Choir sing at your next group meeting, or corporate or private event. 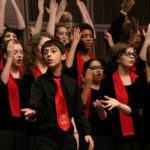 We know you will love your experience hearing the inspiring sounds and spirit of the award winning Cincinnati Children’s Choir! The Cincinnati Youth Choir is committed to interactive community service, as such all fees are open to discussion and negotiation.